The draw for the Fed Cup World Group II first round was done Friday at the Maaspoort arena in Den Bosch and Canadian No. 1 Bianca Andreescu will play the opening match on Saturday at 1 p.m. (7 a.m. ET in Canada) against the Netherlands No. 2 player Richel Hogenkamp. They will be followed in the second match by Dutch No. 1 Arantxa Rus versus Canadian No. 2 Francoise Abanda. 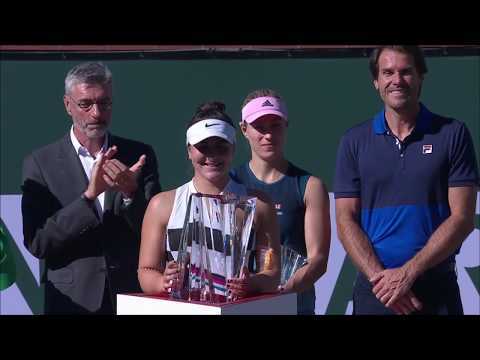 There were no surprises in naming of the singles players and it was basically the same in the doubles as Canadian captain Heidi El Tabakh picked Gabriela Dabrowski and Andreescu as her doubles team to face Demi Schuurs and Bibiane Schoofs of the Netherlands in the fifth and final match if necessary. Last year Hogenkamp beat Andreescu in the qualifying at the French Open before Andreescu returned the favour in the qualifying at the National Bank Challenger in Saguenay, Que., in October. Abanda and Rus, a lefthander, will be meeting for the first time. The last time Abanda played Fed Cup – or at least was scheduled to play – was in the World Group II Playoff last April against Ukraine in Montreal. She accidentally fell doing a little warm-up minutes before her match with Lesia Tsurenko was to start. She hit her head and couldn’t play, having to be replaced by Andreescu and being unable to play the rest of the weekend. The doubles in Fed Cup is the final match of five, unlike Davis Cup where it’s in the middle after the first two singles. Dabrowski would like to see that changed. Below are the four World Group ties also going on this weekend. The losers of these ties would likely – but not for sure because new rankings are done after the results of this round – play the four winners of the World Group II ties, including Canada vs. the Netherlands in Den Bosch, in a World Group I playoff round in April. The respective No. 1 players are No. 3 Simona Halep and No. 5 Karolina Pliskova. FRANCE vs. BELGIUM – Liege, Belgium. The respective No. 1 players are No. 19 Caroline Garcia and No. 21 Elise Mertens. BELARUS vs. GERMANY – Braunschweig, Germany. The respective No. 1 players are No. 9 Aryna Sabalenka and No. 67 Tatjana Maria. AUSTRALIA vs. UNITED STATES – Asheville, U.S.A. The respective No. 1 players are No. 13 Ashleigh Barty and No. 17 Madison Keys. If Canada loses against the Netherlands, it will play a winning team from the zonal competitions also taking place this weekend. That would be in April. No matter what happens, Canada’s next opponent will be determined by a draw at International Tennis Federation headquarters in London on February 12. This is an unlikely sight right in the middle of the central Rotterdam commercial district – a store that is more than familiar to Canadians.